Rumpole Misbehaves by John Mortimer, a Mysterious Review. Review: Horace Rumpole (Rumpole of the Bailey) returns for another case in Rumpole Misbehaves, a delightful mystery in a short novel format by John Mortimer. It starts out simple enough. A 12-year-old boy has been accused of letting his soccer ball roll into a quiet up-scale neighborhood where the residents are obsessed with keeping everything quiet. They promptly file a complaint against the boy citing an Anti-Social Behavior Order. Rumple is asked by the boy's father to represent him. When the boy receives a second complaint, Rumple again goes to court on the boy's behalf, this time to keep the court from sending the boy to a youth prison. In searching out why the residents would complain about a ball rolling on their street, Rumple finds the actual reasons for the complaints: some of the residents are involved in buying and selling young women from foreign countries for the purpose of prostitution. One such young woman, who happened to live on this quiet street, was going to blow the whistle, so to speak, but before she could she was murdered. Although the police have a clear cut case against a civil servant accused of the crime, Rumple goes to his defense. Rumpole is a criminal lawyer for defense in London's Old Bailey. He has yet to be elected to the Queen's Council (QC). The QCs are the leaders of the trial proceedings. They wear black silk robes and white wigs and argue the most important cases. With his present case, he needs a QC to lead him. But Rumple has ways of getting around this rule! Yet all actions have consequences, and at one point Rumpole is called upon to defend himself against a complaint of the Anti-Social Behavior Order. He has been accused of eating and drinking cheap wine in his office, singing aloud in his room causing embarrassment to fellow lawyers, and increasing the risk of global warming by smoking a small cigar in his room. This interesting case is both topical and complex, but the real joy here is in the character of Rumpole and how he uses the system to both his advantage and that of his client. Interspersed between chapters of Rumpole's legal adventures are those of his wife, Hilda (She Who Must Be Obeyed), who offers her own droll and amusing view on life. 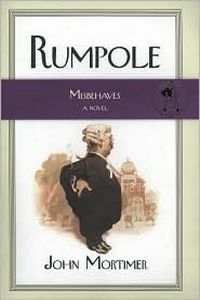 Though relatively short, the author covers a lot of material in Rumpole Misbehaves, with great success. It is a wonderful addition to this terrific series. Special thanks to guest reviewer Betty of The Betz Review for contributing her review of Rumpole Misbehaves. Acknowledgment: Viking Press provided a copy of Rumpole Misbehaves for this review.